I have captured several red ants that might be Formica Pacifica. I grabbed a bunch of them and stuck them into a jar, and I may have caught a queen. I'm not positive, but it is larger and darker than the rest. Anyhow, I've placed them into a more traditional ant farm, using the jar-within-a-jar setup, so they can dig through the dirt. If they start doing anything cool, I'll take pictures. In the meanwhile, I grabbed one of them and threw them into my farm, and it's currently hiding from them. Each time it runs into the black ants, they open up their jaws and threaten it, but they don't seem interested in hunting it down, even when it is crawling around in their nursery. 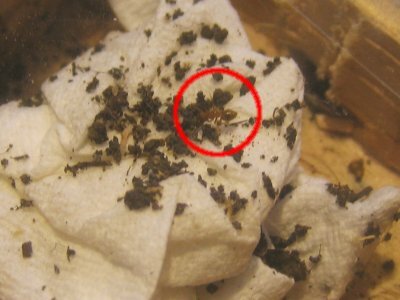 As a result of the invader (and probably my disturbing of the nursery by lifting up the paper towel), the queen has split her nursery into two locations. I knew she periodically placed them into the tube between the nursery chamber and the plant box, where I now periodically place fresh fruit. However, she has also placed some of her young in the foraging chamber. please i want you to teach me the ways you do this thins please i want to start keeping an ant farm i really want to know please. Just click on the 'ants' category on the side and you'll see all the posts I've written on my ant. Although it is quite after the date of posting, I would like to note that the ant in the first image is unidentifiable, while the ants in the second image are definitely in the genus Aphaenogaster. 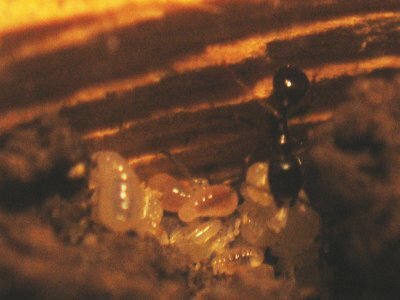 Assuming you are in the west, a common Aphaenogaster is A. occidentalis.